Today I am celebrating plus size designer Monif C.’s 10th anniversary by wearing her stunning blue Jasmine Neoprene Dress. It says a lot about a plus size designer to be able to make it in this industry for 10 years, I have seen many designers and brands come and go, and for that Monif C. truly deserves to be celebrated. This dress is made out of a scuba material and is so comfortable, I also found it to have a nice curve-enhancing effect with the way that it hangs – I am wearing the 18/20 and it also comes in white. I have admired Monif C.’s designs for a very long time now, they are always so beautiful and so different from other plus size options out there. 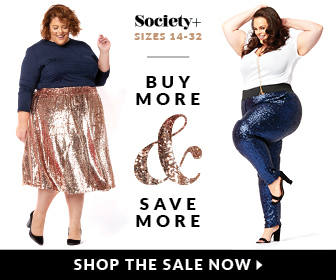 Her designs are always on point and she is known for her playful plus size party wear – speaking of party you can currently save $25 dollars on any $100 purchase right now on monifc.com with the coupon code PARTY. P.S. Have you noticed how my last few posts have all included this bright cobalt blue colour? It is obviously super trendy this season and is such a beautiful colour on pretty much everyone! I like this dress and Monif C in general! Unfortunately here in Italy is difficult to buy the brand..
Omg you are so gorgeous! Love each of your latest blue and black looks! But this one is my fav!!! Many Blessings to you beautiful!! !